Licensing the world's greatest musicals since 1952. In 1952, legendary composer/lyricist, Frank Loesser, and celebrated orchestrator, Don Walker, transformed a fledgling business into what is now known throughout the world as Music Theatre International (MTI). MTI quickly became a driving force in cultivating and licensing new works, as well as sustaining and expanding the theatre audience for generations to come. In 1988, Freddie Gershon became MTI's principal owner, joined as co-owner in the early 1990s by Sir Cameron Mackintosh. Today, Mackintosh is MTI's Chairman and Owner, while Gershon continues to serve as MTI's Co-Chairman. Over the past 25 years, MTI has experienced a new era of business innovation and unprecedented growth in educational theatre. One of America's great composer/lyricists, Frank Loesser is a winner of the Tony Award, Academy Award and the Pulitzer Prize. Loesser began his songwriting career during the Depression as a lyricist, contributing songs to Broadway revues and nightclub acts. His work with composer, Irving Actman, in the 1936 revue, The Illustrator's Show, led to a songwriting contract in Hollywood, where he spent the next eleven years working with such composers as Burton Lane, Jule Styne, Arthur Schwartz and Hoagy Carmichael. Some of his film songs from that period include "Two Sleepy People," "Jingle Jangle Jingle" and "I Don't Want to Walk without You." The first song for which Loesser wrote both words and music was "Praise the Lord and Pass the Ammunition," written during his World War II service. His Hollywood work after the war included the hit songs, "Spring Will Be a Little Late This Year," "A Slow Boat to China", and the 1949 Oscar-winning song, "Baby, It's Cold Outside." In 1948, Loesser was approached by fledgling Broadway producers, Cy Feuer and Ernest Martin, to write music and lyrics to George Abbott's libretto for an adaptation of the classic Brandon Thomas play, Charley's Aunt. The new musical, which starred Ray Bolger, was called Where's Charley?, and was a hit. This led to Loesser's next show, the hugely influential and successful Guys and Dolls in 1950, also produced by Feuer and Martin, with a script by Abe Burrows and Jo Swerling. In 1956, Loesser wrote the libretto, music and lyrics for his next show, The Most Happy Fella, adapted from Sidney Howard's play, They Knew What They Wanted. This groundbreaking and award-winning score contains over 30 musical numbers, and makes extensive use of operatic techniques and forms, including recitative, arias, duets, trios and choral numbers. 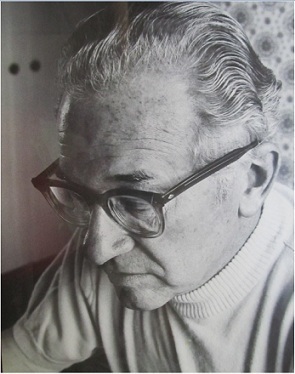 In 1960, he provided the score and was co-librettist for Greenwillow. In 1961, Loesser wrote the score for the Pulitzer Prize-winning How to Succeed in Business without Really Trying. For more information on the life and career of the incomparable Frank Loesser, please visit his official website. Don Walker was a prolific and ubiquitous Broadway orchestrator, a conductor for television and a composer of music for musicals and film. Walker was educated at the Wharton School of Business at the University of Pennsylvania. Like many other orchestrators of his generation, he served a long apprenticeship as an arranger, beginning in the 1930s at Chappell Music with Max Dreyfus (arranger and publisher, 1874-1964, discoverer and promoter of Jerome Kern, George Gershwin, Vincent Youmans, Richard Rodgers and Cole Porter; in the 1920s, he controlled 80-90 percent of all Broadway show tunes). Walker finally went into business for himself in the early 1950s, taking on assistants and apprentices very much after Dreyfus’ own pattern. Many major orchestrators, including Robert Ginzler (Gypsy) and Oscar-winner, Irwin Kostal, started out working for him. Among the 60-odd original Broadway orchestrations that bear Don Walker’s name are those for hits, Panama Hattie (1940), Carousel (1945), Finian's Rainbow (1947), Miss Liberty (1949), Call Me Madam (1950), Wonderful Town (1953), The Pajama Game (1954), Damn Yankees (1955), The Most Happy Fella (1956), The Music Man (1957), She Loves Me (1963), Fiddler on the Roof (1964), Cabaret (1966), Zorba (1968) and Shenandoah (1975). He also contributed special or revised orchestrations to a number of revivals: Pal Joey (1952), Of Thee I Sing (1952), On Your Toes (1954) and others. Walker sustained some flops as well – though fewer than twenty – and among them were shows that later became cult favorites, like: The Gay Life (1961). Anyone Can Whistle (1964) and Anya (1965). The three or four Broadway shows for which he provided his own music did not do well, but a play for which he wrote incidental music, The Beauty Part (1962), was a popular success, riding on the comic coattails of Bert Lahr and Alice Ghostley. Walker always tried to give each of his Broadway scores a unique sound befitting the show’s subject or setting: emphasis on the accordion in Fiddler on the Roof, use of a bouzouki in Zorba or an absence of high strings in Anyone Can Whistle. Composers who collaborated frequently with him included: Richard Rodgers (Carousel, By Jupiter, Me and Juliet), Cole Porter (Leave It to Me!, Something for the Boys, Silk Stockings), Frank Loesser (Greenwillow, The Most Happy Fella), Jerry Bock (Fiddler on the Roof, She Loves Me, The Rothschilds) and John Kander (The Happy Time; Cabaret; Flora the Red Menace; Zorba; 70, Girls, 70). Walker also made choral arrangements for Fred Waring's Pennsylvanians, and briefly conducted "Your Hit Parade" on television. Walker lived the last decades of his life in New Hope, PA, with his wife Audrey; they had two children. After a long illness, he died in a Trenton, NJ, hospital at the age of 81. Bio courtesy of Masterworks Broadway. Who created the MTI logo? MTI’s logo, which features a left-handed conductor, was adapted from an illustration by legendary artist, Al Hirschfeld, that was commissioned by Music Theatre International. Mr. Hirschfeld was the leading caricaturist of Broadway, having created illustrations of major shows and stars since the 1920s! He died on January 20, 2003, at the age of 99. After the birth of his daughter, Nina, in 1945, Mr. Hirschfeld made a game of hiding her name, often several times, in each of his drawings. The MTI staff has been able to find eight in the original drawing (reproduced above). Through the years, MTI has had fun in adapting elements of the original art for use in our catalogues, newsletters, flyers, posters and website. 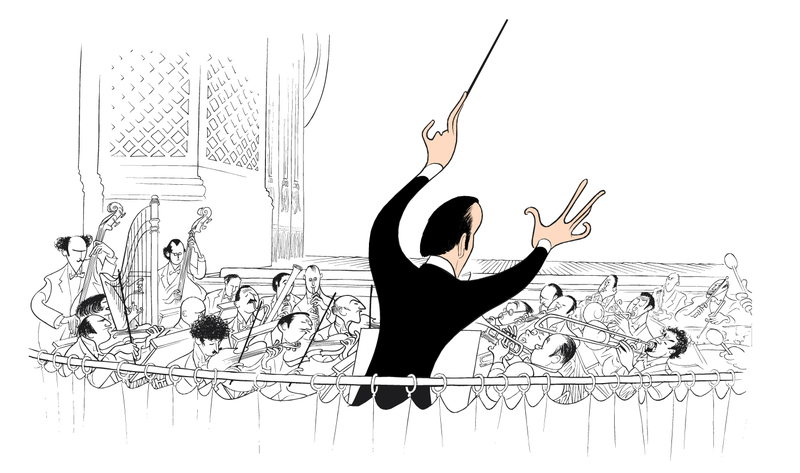 Although it is assumed by many that the conductor in the illustration is Frank Loesser, one of MTI’s Founders, it is not. Mr. Loesser was right-handed. For more information about Al Hirschfeld and his historic drawings, please visit the Al Hirschfeld Foundation website.